No particular significance to this image. Just thought it was dramatic. 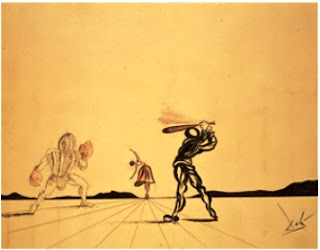 Who knew that there was a connection between Salvador Dali, Walt Disney, and baseball? Besides there's an important Dali Museum near the Rays home. Now that the player stats are wrapped up, a few odds and ends from the last couple of days before I hit the road for a week. Over on Rays Prospects, Bulls fans need to visit and vote on their “readers’ choice” hitter and pitcher of the Bulls. Have to do it within the next couple of days. Also at Rays Prospects are some great summaries of this year’s action in all of the Rays’ minor league teams. Check it out. Every reader of this blog who attended a game at the DBAP this year has, of course, already bought a duck for the Great American Duck Race and support the kids who the real work putting the Bulls games on TV. In the very remote chance that you haven’t, or perhaps you watched on TV and didn’t make it to a game, here’s your chance to do it now. I checked out MiLB.com’s TV this season and the Bulls definitely outshine the rest of the IL. Much of the credit has to go to Explorer Post 50. So, Buy a Duck! The 2012 schedule is out. It looks a bit better than 2011, but that’s not much of an endorsement. It starts the season at the DBAP (I guess the Dukies and the ACC are letting the Bulls have their ballpark back early). But wait! Right after the opening series the Bulls hit the road for two weeks!. Oh, well, weather can be really crummy in April anyhow. Something I never got around to mentioning the end of the season is a very interesting project called Bull City Summer. So far it looks to be driven by some ideas from Sam Stephenson, who has some serious creds from the Center for Documentary Studies and the Jazz Loft Project. The test run at the end of the season had some terrific interviews, photographs, and Adam Sobsey’s Indy Week columns from the end of the year. Take a look. This could be something really interesting to watch next year. Speaking of Adam Sobsey, he had a very interesting sort of end-of-year piece over in Baseball Prospectus. Features a close look at Russ Canzler and others in the final days of the season. And speaking of Russ Canzler, the box score from Thursday night’s game in Yankee Stadium highlights a bunch of September call-ups including Matt Moore, Dane De La Rosa, Alex Torres, Russ Canzler, Brandon Guyer, and Dan Johnson. Some did great (Moore), some were awful (De La Rosa and Torres), one got his first major league at bats and hits (Canzler), and Johnson and Guyer drew walks and scored runs. I'm working on my annual lists of Well Dones and Areas To Work On for the Bulls/DBAP fan experience. See last year's list and comments here. Please lend me your voices in the comments section and I'll write it up when I get back in town. Areas to work on: vendors and food choices. PLEASE bring back Domino's pizza and the fish dinner. "PLEASE bring back Domino's pizza"
Things that were very good this year: new giveaway format, diamond club benefits, occasionally having an usher on the 110/112 aisle, finally adding names to the navy blue jerseys, holding the line on ticket and food prices, chicken tenders basket still a super value, a better variety of between-inning on-field promotions, good work on the fireworks, and a generally high level of enthusiasm from all Bulls staff. Things that I feel need work (mostly concessions): hot dogs should not be precooked until they look like shoe leather, hot dogs should not be served on ice cold buns, Hampton Farms in-shell peanuts were lousy this year (perhaps a bad harvest? ), on many $1 Thursdays the concessions volunteers couldn't keep up with the crowds, not having an usher on the 110/112 aisle as often as needed. I thought the new pizza was OK. However, I confess that we only ate it on Thursdays, to avoid the $1 lines at the main stands. If it was Thursday and we arrived after 6:15 PM, we'd almost always be eating at Papa Johns, Moes, or The Pit, saving a few bucks wasn't worth missing 2-3 innings of baseball to me. Who else was really jazzed last night to hear Safety Dance and then see DJ hit it out to tie the game in the 9th and ultimately once again defeat the Red Sox (albeit indirectly). Very nice to see those former Bulls out there making a difference for the Rays last night. Sidenote: Anyone noticed this tattoo on Guyer's arm before? wow! What a great game and grat run. So cool tonhear of DJ doing his thing in the 9th. And now Matt Moore is starting game 1 of a MLB playoff series. Talk about a fast trip up. Hope he does well tonight and then still has the ego to do well for us next year.